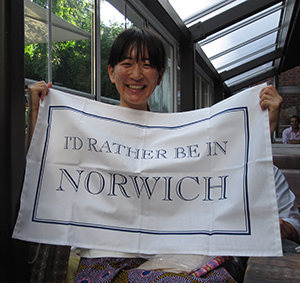 Younjung Oh was the first Robert and Lisa Sainsbury Fellow to be based in Norwich. During her one-year fellowship between September 2012 to August 2013, she continued deepening her doctoral research on ‘Art in to everyday life: Department stores as purveyors of culture in modern Japan’. Her aim was to articulate the politics of ‘fine art’, which constructed and manipulated the language, categories and values of art. During her fellowship, she organized an international workshop with specialists in the field to investigate tôyô shumi or Oriental taste in Imperial Japan. Since her fellowship, she has spent a year as Visiting Assistant Professor at the University of Oregon and is now Lecturer at Seoul National University in Korea. Here, she reflects back on her time in medieval Norwich. It was 2008 when I first learned about the Sainsbury Institute for the Study of Japanese Arts and Cultures. In the fall of that year I met Professor Nicole Coolidge Rousmaniere in the Department of Culture Resources Studies at the University of Tokyo, where she was teaching as a Visiting Professor and I was studying as a Research Student. Her enthusiasm for the study of Japanese arts and cultures and her scholarly networks across the world first made me curious about the Institute she founded, and then I started to dream of working there some day. Four years later in 2012 when I completed my doctoral dissertation at the University of Southern California in Los Angeles, I was privileged to receive a Robert and Lisa Sainsbury Fellowship and become the first fellow based in Norwich. I was thrilled with my move from post-modern LA to medieval Norwich. It was a unique and exceptional experience to have an office within the Norwich Cathedral Close. The Norwich headquarters of the Sainsbury Institute offered a perfect working environment to concentrate on research and writing. Over the year of my fellowship I benefited tremendously from the Lisa Sainsbury Library, one of the most comprehensive collections of books on Japanese art in Europe. If there were any research materials I needed that were not available, the librarian Akira Hirano very generously helped me to locate and acquire the resources both in Japanese and English. In addition, the Institute’s affiliation with the School of Oriental and African Studies (SOAS), University of London, and the Sainsbury Center for Visual Arts, the University of East Anglia (UEA) facilitated access to their libraries. I was able to get Japan related resources at SOAS and art history related ones at UEA. While Norwich is a calm city with not many distractions where the fellows are able to devote themselves fully to their research, the Sainsbury Institute is an intellectually dynamic center where numerous scholars from around the world congregate to share their research. I was amazed by the fact that I could meet so many Japanese specialists at this small medieval city in the east of England. Stimulating conversations with visiting scholars with wider range of expertise broadened my ideas and views beyond my own research interests. I also went to London periodically to attend varied events and conferences held at the British Museum, SOAS, the Japan Foundation, the Daiwa Foundation and so on. During my visit to London I set up my base camp at the then London office of the Sainsbury Institute at SOAS, which made my trip much more convenient. The fellowship provided me with the opportunity to present my work on the artistic practices of Japanese department stores at prestigious institutions in the UK. I gave talks at the Japan Research Center Seminar Series at SOAS, the Series of East Asian Seminar at the University of Cambridge, and the Third Thursday Lectures at the Sainsbury Institute. From distinguished scholars of Japanese studies to the public with a genuine interest in Japanese arts and cultures, I had broad range of audience. I am grateful to all my audience for their invaluable comments from various perspectives. The talk was developed into an article “Shopping for Art: the New Middle Class’s Art Consumption in Modern Japanese Department Stores,” which will be published in the Journal of Design History (forthcoming). One of my most meaningful experiences as a Sainsbury fellow was to organize a workshop on “Tōyō shumi(Oriental taste) in Imperial Japan” in June 2013. Strong support from the Executive Director, Mami Mizutori and competent staff of the Institute enabled me to invite leading scholars from the UK, Japan, and the US to the workshop. I also presented my work-in-progress on the Oriental section of Japanese department stores that provided the metropole Japan with artifacts from China, Korea, Taiwan, and Southeast Asia. I felt very fortunate to be able to take advantage of this workshop as an opportunity for considering my new research project within the broader phenomenon “tōyō shumi” and receiving feedbacks from respected participants, who have conducted research on the ways in which the imperialist rhetoric of “tōyō” was appropriated and negotiated within various visual cultural practices and forms. Coincidentally, an international symposium on Japanese Modern Art and its History was held at SOAS a week after my workshop. 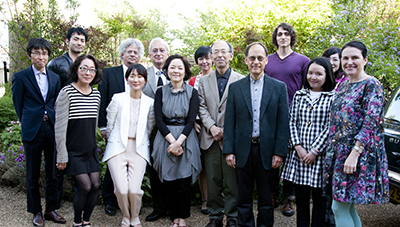 This symposium was a historic event in the study of modern Japanese art history in which six most prominent scholars who introduced fresh approaches to the field participated. I had a great honor of taking part in this symposium as one of the young scholars, whose researches have been indebted from their pioneering studies. It was particularly valuable for me to develop relationships with scholars in the same areas of interest. 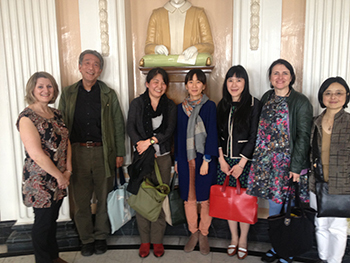 My year in the UK culminated with a research trip to Glasgow with Nicole, Professor Kinoshita Naoyuki, Akira Matsuda, Maki Fukuoka, and Hiromi Uchida. The Sainsbury Institute sponsored our trip to examine the collection donated by Japan to the Glasgow museum in 1878 and the Henry Dyer Collection of the Mitchell Library. It was an academically important trip for understanding British-Japanese cultural exchanges during the Meiji period. Personally it was also a particularly precious trip for me to travel with my teachers and senior friends (senpai) whom I respect and like. For my fellowship year, the Sainsbury Institute served as an ideal incubator for a novice PhD to get ready as a researcher and a teacher. My classes and current projects have continued to draw on ideas and research from that year. I am sincerely appreciative of the Sainsbury Institute and its staff and dream again of returning to Norwich.